On Saturday we displayed our new sign board at the Threatened Species Day at the Waterfront. This is a collaboration between the Territory Wildlife Park and Land for Wildlife Top End. The sign colorfully displays information about the beautiful Black-footed Tree-rat, how to help protect this threatened species and how to ID it and the differences between it and a black (feral) rat. This outdoor sign will be displayed at the Territory Wildlife Park to give information to visitors and we are hoping to print more to be displayed in Land for Wildlife schools that engage in educational programs about local threatened species. We are working on citizen science projects with landholders to collect data about presence of arboreal mammals and their nest box use, this is part of a process to promote the Black-footed Tree-rat awareness (and other native mammals) further into the community. Troy and Peter have been working on the 5 acre property in Leanyer over the last 2 years to restore it to native habitat, complete with beautifully landscaped paths using found rubble from the property. They also salvaged fill from construction sites and have planted over 500 plants. This hasn’t been easy and has involved a lot of hard work, removing vast amounts of Coffee bush, grassy weeds including Gamba and Mission Grass and concrete rubble; in fact many of the large native trees including beautiful Ghost gums and Milkwoods were only discovered on removal of the Coffee Bush. The 500 plants were mainly grown at the Greening Australia nursery but Pete and Troy have also been growing many plants themselves after attending propagation workshops, with successful acacias and native peanut trees popping up from the seed of trees planted just one year ago! The difference in one year is incredible, with plants being planted with assistance from the Green Army in December 2016 and December 2017. 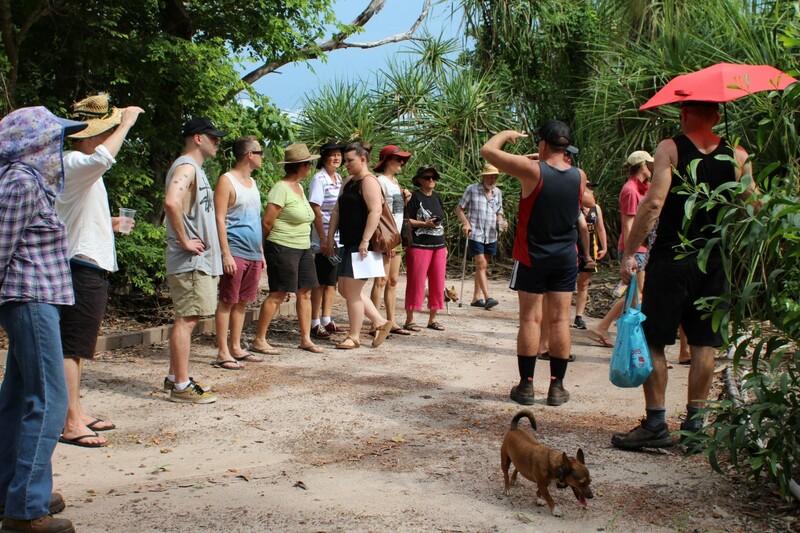 IN December during a guided walk and talk, a group of 16 people, including those also involved in the replanting program enjoyed a walk and landholder story. 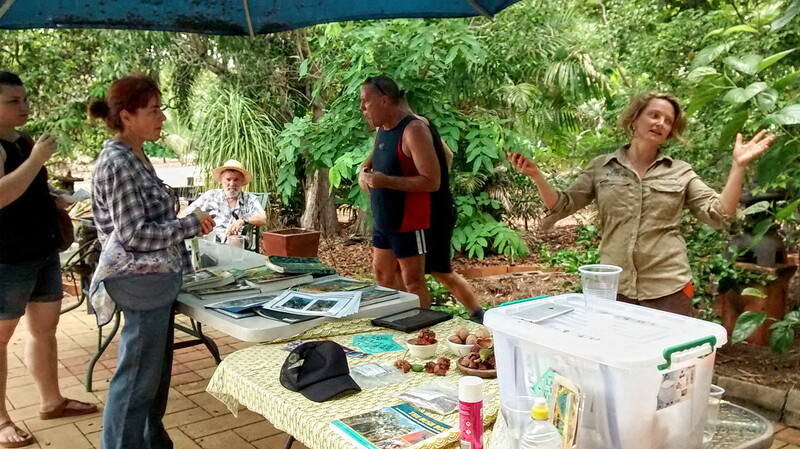 This was followed by seed collecting and propagating workshop by the pool and landholders got to practice and take plants home. Among some amazing presenters with a focus on mammal decline our Land for Wildlife programs were represented at a forum, we presented on the Black-footed Tree-rat and our programs to assist awareness and habitat enhancement. We are continuing to work with the PEW trust with their focus on Gamba management. 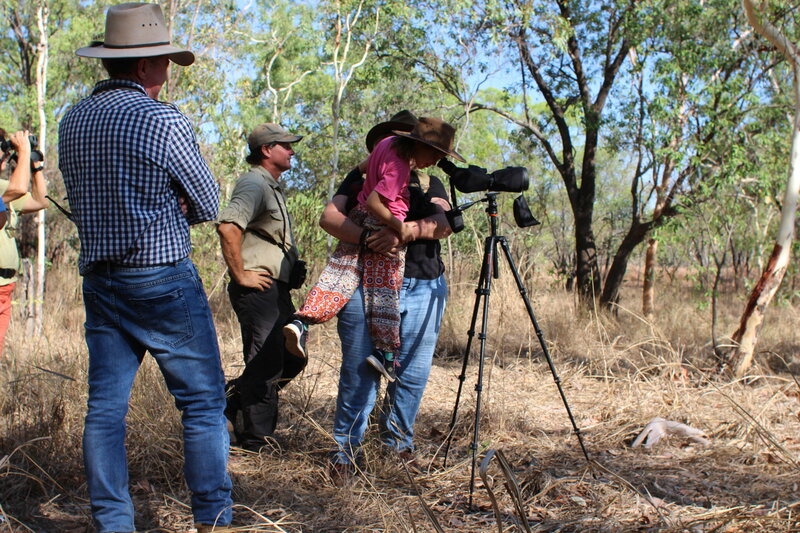 We spent some of bird week in Katherine, and Mick Jerram, Land for Wildlfie member and well renowned bird specialist hosted a Bird Watching tour on the 888 hectare Gorge Road property that he helps manage. A beautiful group of around 20 Katherine locals joined us to check out the property and birds. We have been working together with Clare Pearce from Katherine Landcare group, who also double as Parks and Wildlife Community engagement officer. While we were there we also jointly hosted a plant propagation workshop and signed up another wonderful property on Gorge Road to Land for Wildlife, as well as checking nest boxes. 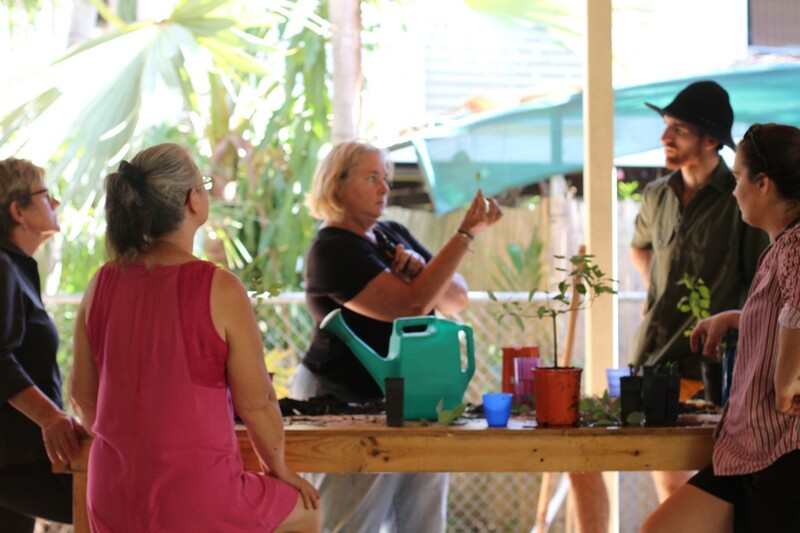 There are some fantastic residents down in Katherine with more joining the program and we are looking towards a set up where Landcare Katherine can assist landholders in the region. The Pickering family who have a wonderful property backing onto the Katherine River showed us their area of wildlife habitat and I showed Clare how we conduct an assessment. There are a few nest boxes on our properties in the area and we hope to run more events this year. Land for Wildlife members Peter and Troy have been working hard to re-grow wildlife habitat on their 5 acre property in Leanyer. Come and share their landholders’ story of re-vegetating their block towards a beautifully landscaped wildlife habitat (from a previously big disturbed mess of Coffee Bush and grassy weeds). Be inspired by their hard work and also learn more about re-vegetation techniques, simple propagation techniques and the Black-footed Tree-rat enhancing habitat projects that Land for Wildlife are running. 181 Leanyer Drive. An orange “Growing Towards Land for Wildlife” sign is on the gate. Please park on the road. Dress ready for a short walk outside in the sun and bring a water bottle. A Green Army member, Anais and landholder Peter replacing any plants that did not make it through the dry season. Nov 2017. The Aussie Backyard Bird count is 23- 29th October this year. We will be hosting a guided bird watching walk and talk on a very large Land for Wildlife property in Katherine this year. 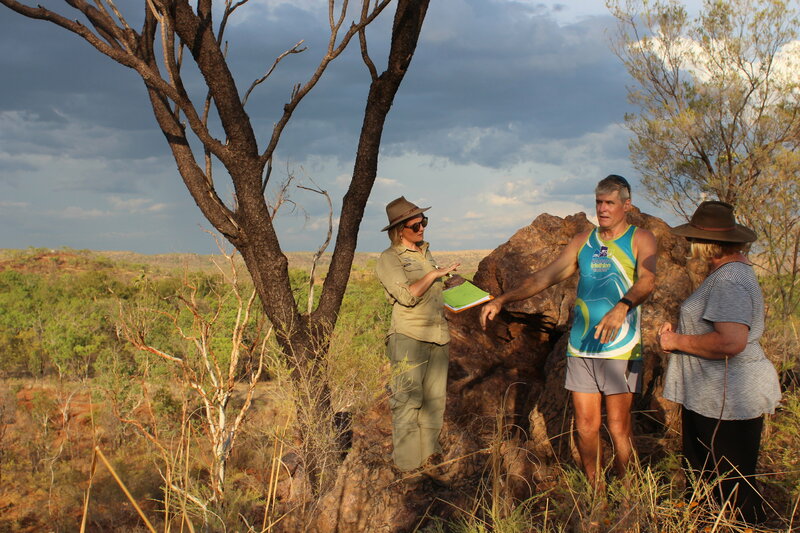 Mick Jerram, local tour guide and manager of the land will be guiding the walk. Photograph courtesy of Top End Tourism. 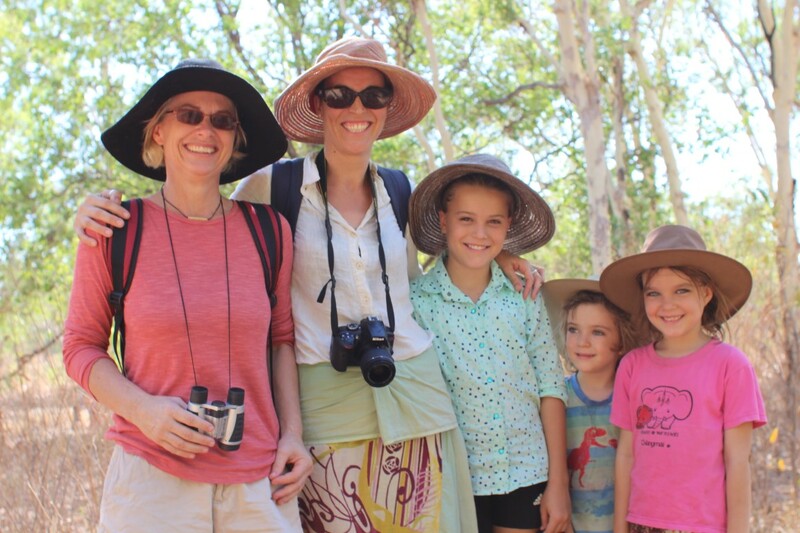 Join Mick Jerram of Gecko canoeing on a beautiful Land for Wildlife property for a bird watching walk with one of Katherine’s most experienced wildlife tour guides. Find out more about birds in the Katherine region the Land for Wildlife program. This is part of Aussie Backyard Bird Count (https://aussiebirdcount.org.au/) And YES Gouldian finches have been recorded on the property- you never know! Directions- Drive towards Nitmiluk Gorge from the stuart highway. 20.3 kms on the right there is a small turn off which will be marked. Map and further directions to be added. PLease park opposite Maude Creek Lodge. Please bring water, hat and boots/ good foot wear and binoculars. Share cars if possible and tell your friends. The walk is 1 km. Mick Jerram on the Land for Wildlife property. Land for Wildlife hosted a Fire Workshop back in May with a focus on Fire and the effects on wildlife, particularly arboreal mammals. The subject is of course complex and controversial but vital to the management of our landscapes and the ecology of our native species. To try a give a balanced perspective we organised a very well known fire ecologist Alan Andersen to present alongside Natalie Rossiter on the findings of fire experiments that have been conducted over several years in bushland at the Territory Wildlife Park and then for participants to be given an insight into the effect of fire on Wildlife and landscapes from a land manager’s point of view with Andrew Spiers giving a walk and talk, who also has many years of land management experience from National Parks and teaching and observing in the field. There are of course many other experts in fire and many studies and perspectives to consider. Over 20 people attended the workshop, including fire volunteer and land managers. They were shown the fire plots at The Territory Wildlife Park and then invited for a walk and talk on Andrew Spier’s property on the nearby Blackmore River flood plain. Greg Miles also attended and offered his perspective from being a long term ranger and Land Manager in Kakadu as well as managing his own Land for Wildlife property. Often it is perceived that there is too much fire in our landscapes in the Top End, often started by people with little knowledge of fire ecology (such as people out on quad bikes having fun or just driving along). Many preventative “prescribed” burns are carried out to induce an early (dry season) cool burn rather than a later hotter “accidental” burn when winds are higher and fuel load is drier. Savannah Landscapes have been shaped by fire over a very long time in Australia to be dominant in species with fire survival mechanisms that thrive with fire such as Eucalypts and grasses. Riverine areas, Monsoon forests and wet lands are more sensitive areas of vegetation and frequent fire does not allow them to regenerate as a Savannah landscape does. Often as these landscapes are bordered by woodland there can be a knock on or edge effect. Gamba grass is a considerable factor in adding to fuel load and curing only to burn later, when fire is hot and to intense for other native species to recover. Generally when fire is absent the tree layer becomes more mature and dense and fire sensitive species start to colonise, the grass layer reduces. In the case of arboreal mammals, the absence of fire is favourable as mid-story fruiting plants, rainforest fruiting plants are more abundant as a food source and old growth trees stand for longer and harbour hollows. It is very difficult to manage fire on a large property as there are many “Wild fires” which are uninvited. Many flowering plants are lost when this happens on the floodplains. Most land managers have adopted the advice of fire experts and been doing early dry season burning (EDS) for the protection of assets and to prevent destructive late season fires (LDS) later in the year. While there are very good reasons to use EDS for this purpose, I would argue that what suites asset protection may not suit the natural ecology. After 40 years of involvement in natural area fire management I have come to the view that EDS burning is cumulatively killing the woodlands of the Top End. There is a mountain of circumstantial evidence to support this hypothesis, but it is contradicted in part by some research findings, especially CSIRO’s Kapalga Fire Experiment of the 1980’s. But it is clear to me that frequent EDS burning promotes annual grasses, especially native speargrass. Burning encourages more grassy fuel which encourages hotter burning which encourages more grass – ad infinitum. Thus a “grass fire cycle” is created. This cycle is improving the hunting success of cats and is slowly killing the pre-European ecology of the woodlands. Add in Cane Toads and invasive African Grasses and you have the perfect storm. But there is a way to break the grass fuel cycle. In my view the solution is to reduce the amount of EDS burning and instead, dramatically increase the amount of early wet season burning (EWS). Sure there are many practical problems with doing this, but they can be managed. WSB is more intellectually demanding than EDS burning, but that should not be seen as a reason not to do it. My prediction is that if land managers were to switch from EDS to EWS burning they would see a rapid turn around in the ecological health of the natural woodlands landscape.